Textile artist Arianne King Comer is interested in the cultural traditions of the African Diaspora, and much of her research focuses on indigo cultivation and dyeing. Comer travels with wax pans, imprinting stamps from the countries that practice batik, a collection of dyes--including indigo--for cotton and silk, and examples of textiles from her collection. 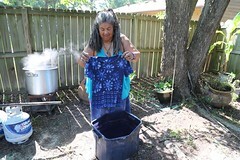 As an indigo advocate, she shares a native South Carolina indigo plant (she left one with us last year that will be transplanted in Lizzie’s garden this summer) and several films on the indigo process in various countries, including the iconic Daughters of the Dust. Indigo has an ancient history and was found in many different parts of the world, but in the 18th century the Sea Islands of South Carolina were a center of indigo production, and Charleston exported vast amounts of indigo. (Along with rice and cotton, indigo formed the basis of South Carolina’s wealth.) Indigo was the foundation of many West African textile traditions, where women, in particular, were known for their dyeing expertise, and enslaved West Africans worked the labor-intensive indigo plantations. For IBILE! Ancestral Call in Cloth, a continuation of the residency we piloted last summer, Comer will set up a month-long, all-ages, drop-in indigo-dyeing studio, inviting groups and individuals to join her at the dyeing vat as she relates the history of indigo and teaches different resist-dyeing methods, particularly traditional batik, adire (Yoruba), and shibori (Japanese) techniques of designing on cloth. Comer will participate in the Family Free Day (during last summer’s family day, 400 people joined Comer to re-design and re-dye pieces of their clothing or the cloth and clothing items we provided, and wore those garments proudly to subsequent performances on the porch). Working with community members, she will design adornments for Citizen’s expanded cast, as well as cloth banners that will be installed in proximity to Eliza’s cabinet and Lizzie’s garden. She will continue the community project we launched last summer to memorialize Lizzie’s Garden by creating a cloth cookbook using resist dye techniques that collects local recipes for the vegetables growing in the garden. Comer will again work with children from Walker’s Point Center for the Arts in our collaborative Citizen camp. Comer’s dyeing studio is open as part of the price of admission to all visitors to Lynden, but we will waive admission for those for whom it is an obstacle to participation. We have also recruited groups, as we did last summer, to participate. Comer’s residency will be preceded by an exhibition of her cloth-based work (paintings, clothing, design) in Lynden’s gallery. Once she arrives, we will turn the gallery into another Lynden lab space, displaying work made by Comer and the community throughout the residency. This exhibition, which has the potential to change daily during the residency, will remain on view in its final form through August 19.